File this race under "you couldn't make it up" ! 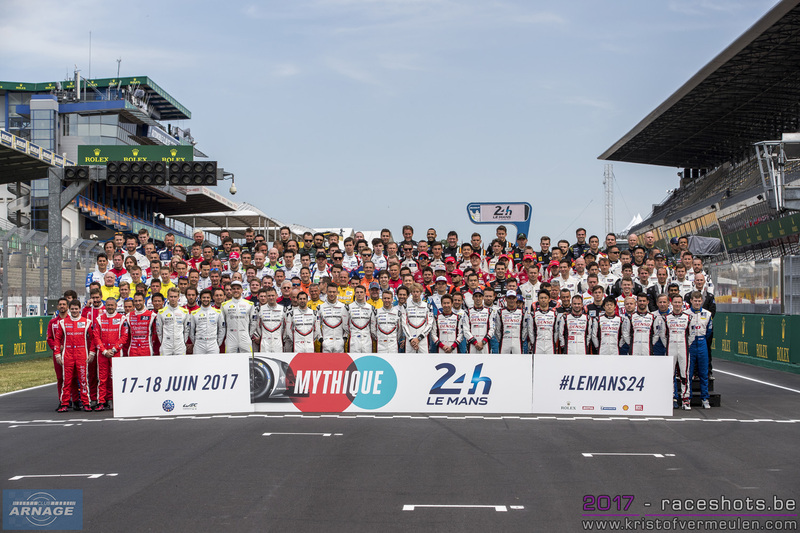 As the grid was assembling under blazing sunshine, quite a few VIPs were spotted including FIA president Jean Todt, official Le Mans 2017 starter the F1 boss Chase Carey and Le Mans legend Jackie Ickx. Another familiar face was Dr Wolfgang Ullrich the boss of the Audi prototype programme for many successful years. The only non-motor-sport celeb was Maria Sharapova. 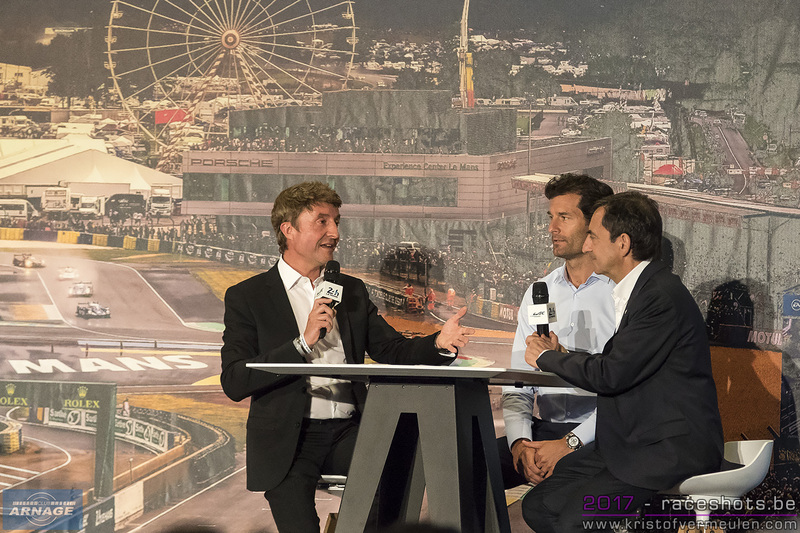 The grand marshal of the event was F1 and WEC superstar Mark 'Aussiegrit' Webber, who got the honour of driving the pace car for the start. Although the crowd appeared to be slightly less numerous than last year they were no less enthusiastic. There was a particularly animated performance of the french national anthem. 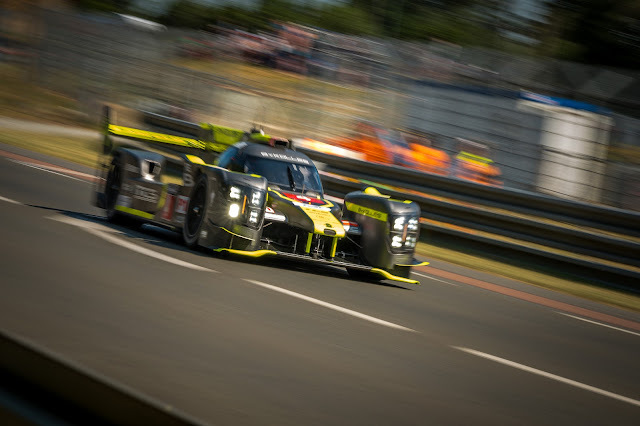 Race start was promptly at 3pm and during the first lap the ByKolles #4 (Webb) was trailing smoke after an unseen contact and Jani the #1 Porsche passed Buemi in the #8 Toyota. Meanwhile Jarvis in #38 Jackie Chan DC racing was up to the lead of P2 from 3rd. 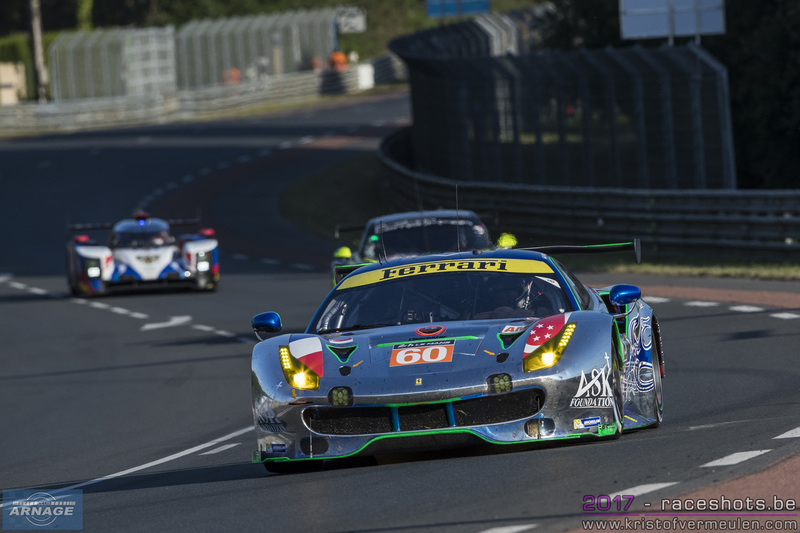 Guidi in #51 got himself up to lead of GTE Pro from 2nd on grid. The #9 Toyota (Lapierre) showed evidence of damage from the opening lap. The #4 ByKolles (Webb) returned to pit-lane and got a new nose. 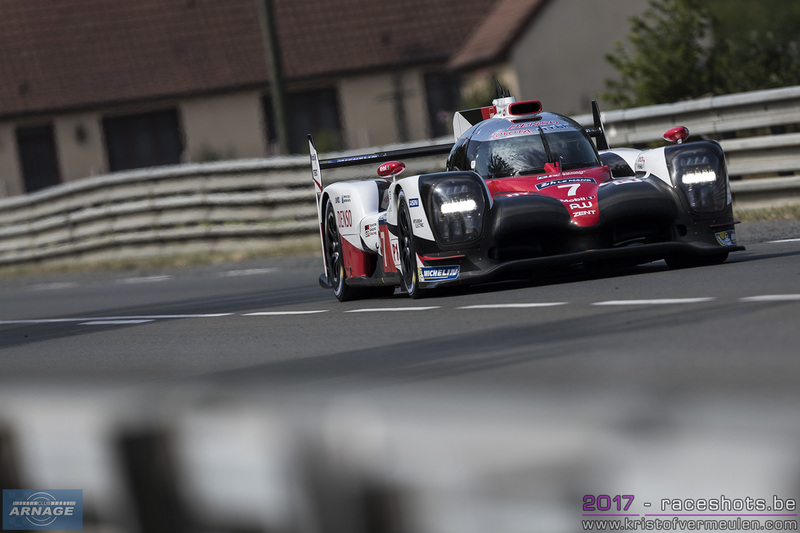 On a clear track with no traffic, Mike Conway in the #7 Toyota set the fastest lap 3:18.932 on lap 3 which remained fastest for almost the entire race. Rusinov in the #26 G-Drive Oreca had an inexplicable spin at pit entry and was stranded for a while. 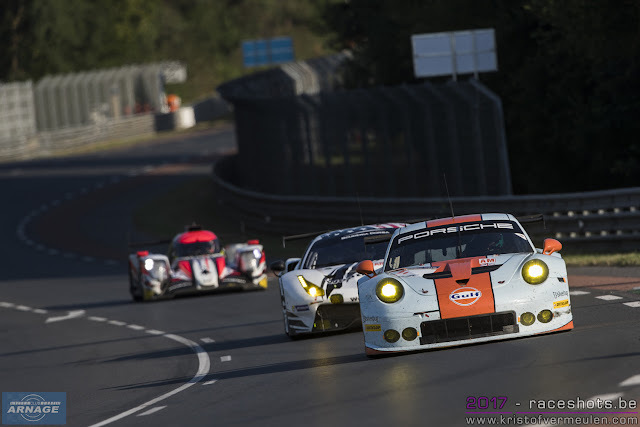 Just after the turn of the 1st hour the Lapierre in the #9 Toyota was forced to edge of track passing group of GTE cars, and just a few minutes later Al Qubaisi in the #88 Porsche was hit by Rusinov in the #26 G-Drive at Porsche curves. 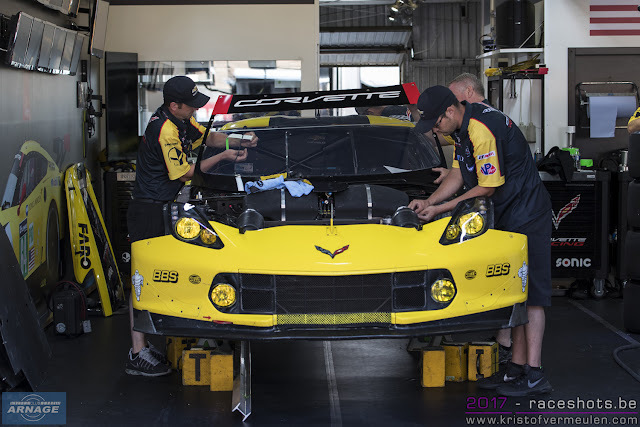 The #88 was too damaged to continue but the #26 returned to pits. Barrier repairs at Porsche curves caused a slow zone to be called. At 16:41 the #4 Bykolles retired. At 17:04 the 50 minute slow zone was lifted. At 17:15 Pla in #66 Ford GT set fastest lap in Pro 3:51.828. At 20:01 #82 Ferrari (Kaffer) was touched by Vaxiviere in #28 approaching 1st chicane bringing about a slow zone at sector 3. The #82 nose was destroyed and lots of debris thrown on track plus the barrier was damaged. A slow zone on 1st section of Mulsanne was called to clean up the mess. At 20:32 the slow zone was lifted. The #28 was awarded a 7 min stop and go for the collision with #82. 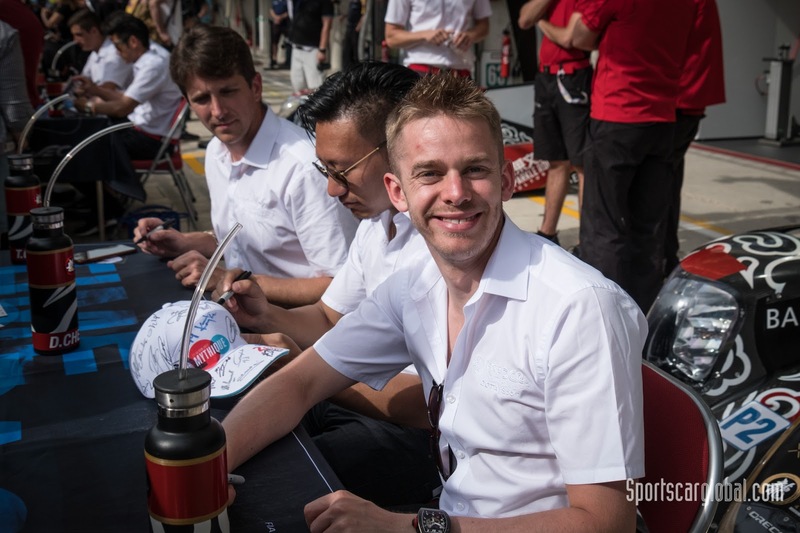 The #8 Toyota of Nakajima passed Lotterer in #1 Porsche to take 2nd place. 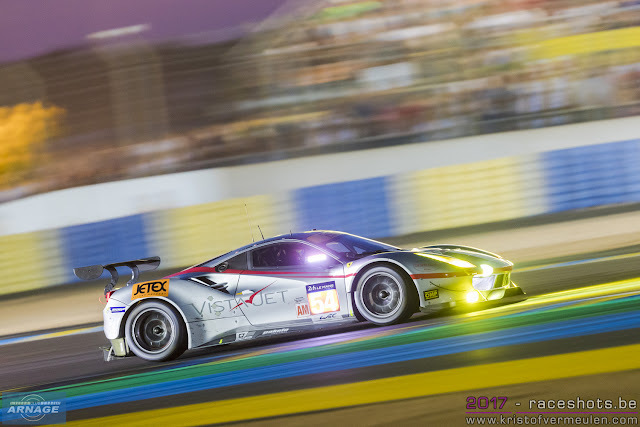 At 21:44 the 60 Ferrari of Wee went into gravel at Mulsanne Corner bringing about a double yellow and then a slow zone. About a half hour later #49 Keating Motorsports Ligier (Konopka) went off off at Indy causing yet another slow zone. At 22:15, Lamy in #98 Aston Martin came slowly through out of Mulsanne corner with a right front puncture which had flailed and taken wing and light out. There were more signs of more trouble for Toyota at 22:25 when #8 (Buemi) appeared to be losing fluids. At 22:51 Milner lost a wheel from the #64 Corvette and was propelled into the barrier at the approach to pit entrance. Milner managed to coax the car back to pitlane. The fight in GTE Pro was intense and stayed that way all through the night and into Sunday. Pla in the #66 Ford GT made himself unpopular by filling the car with gravel at Mulsanne corner then depositing it along the track up to Indy. This brought about a safety car period for the area to be swept. Just as the safety car period ended Kobayashi in the #7 Toyota was spotted going slowly, stuck in one gear. He tried hard to get the car back to pitlane but eventually had to give up the struggle almost in sight of pit entry. Within half an hour Lapierre in the #9 Toyota was going slowly with smoke and flame visible from the rear as a result of a shredded tyre. 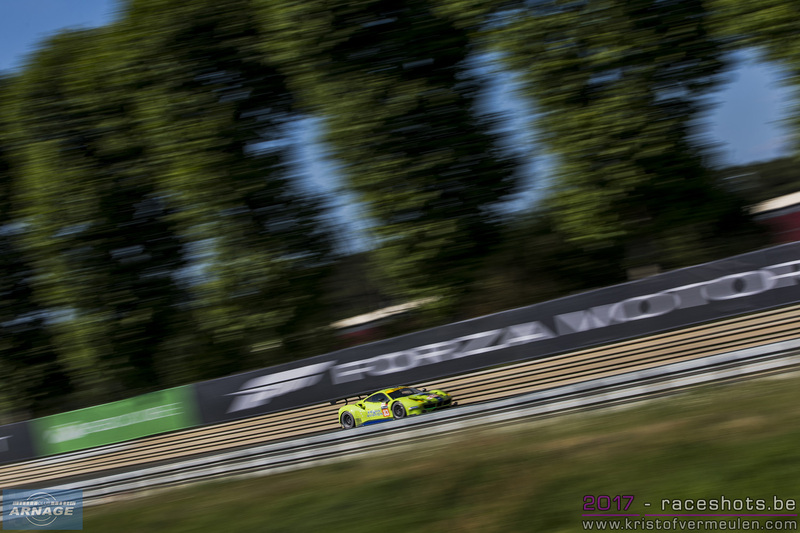 Lapierre Stopped at Porsche curves then started again. The car finally stopped for good at approach to Ford chicane and Lapierre got out. At 1:46am the #7 and #9 were official retirements and Toyota's three had become one. At 08:25 Stanaway in the GTE Pro leading #95 Aston Martin went into the tyres at Arnage. He managed to keep going over the gravel, and rejoin with damage to the front and return to the pits for a lengthy repair. 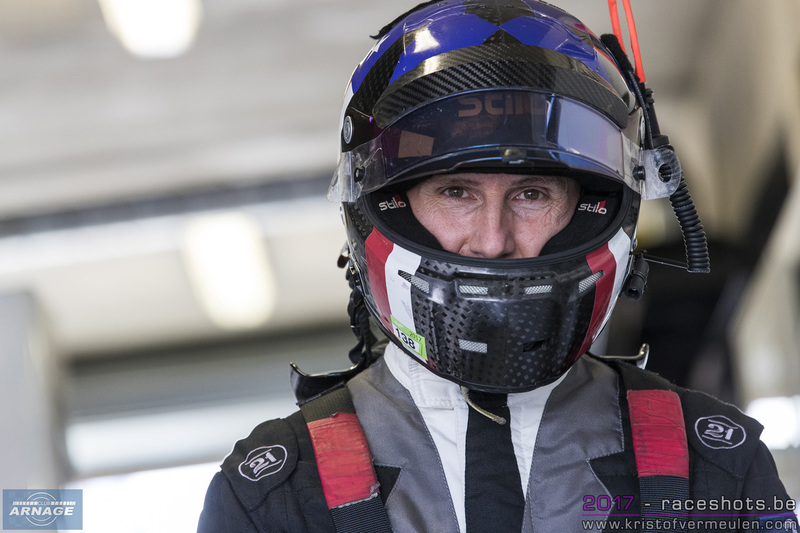 We later caught up with Tom Kristensen who commented "It is a very difficult corner because you arrive there from Indianapolis with hot brakes, it's a rookie mistake, but Stanaway is not a rookie "
By mid morning on Sunday the only real race was GTE Pro where the top four exchanged the lead at each pit stop. 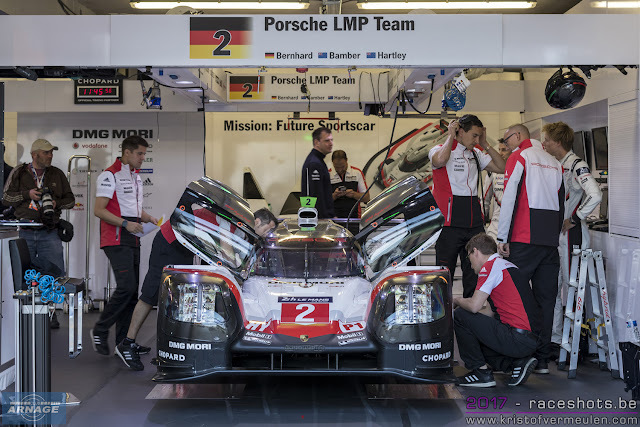 An hour of fitting a new hybrid wheel motor to the #2 Porsche and two hours for a similar job on the #8 Toyota had left the #1 Porsche 11 laps ahead of the LMP2 pack with the nearest LMP1h cars out of contention. The #1 Porsche looked untouchable right up until 11:30 when Lotterer rolled to a halt at the side of the track at the bottom end of the Mulsanne straight. 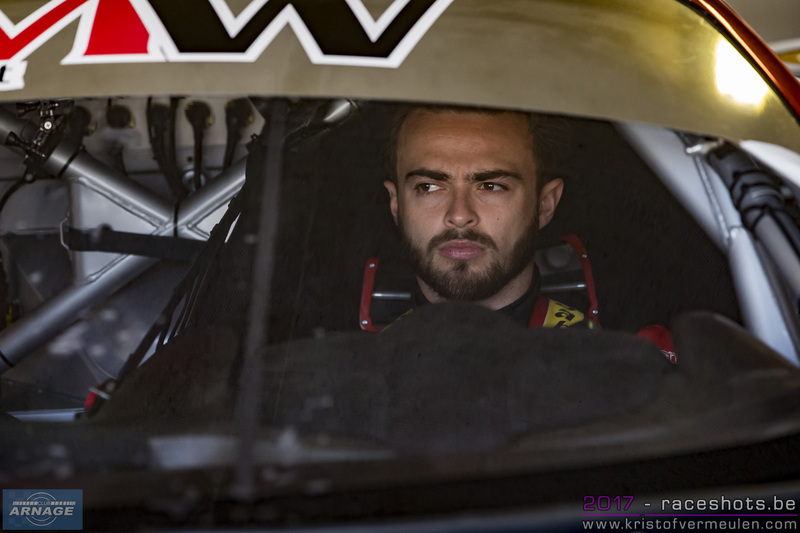 With such a lead, the car remained at the top of the timing screen for some time, but the end was inevitable. 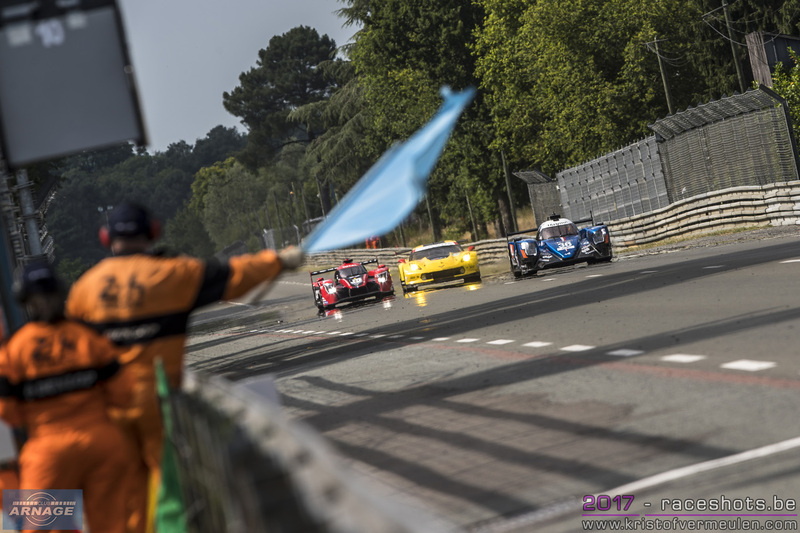 The leading trio of #38 Jackie Chan DC Racing Oreca, #13 Valliante Rebellion Oreca and #35 Signatech Alpine hacked away at the laps. 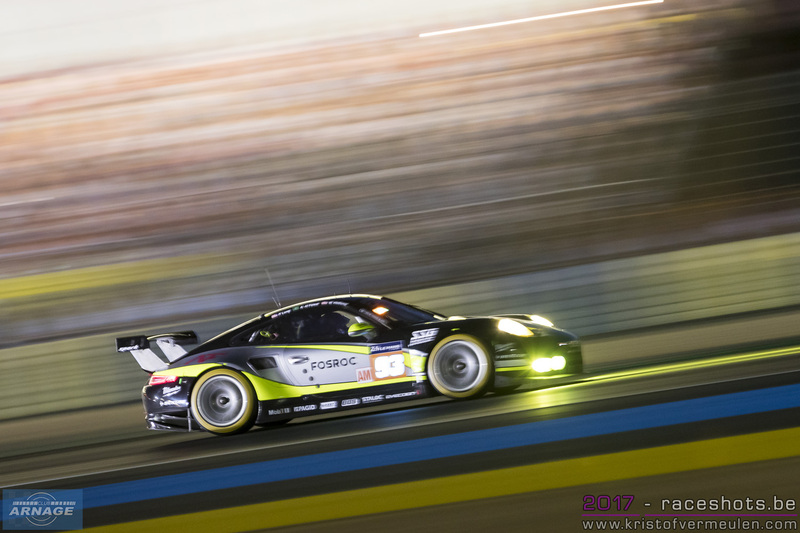 Meanwhile the delayed #2 Porsche that we had counted out last night had also been chipping away at the laps and by 11:30 had recovered to 5th place and theoretically able to challenge for a podium finish. By noon Hartley in the #2 had risen to 2nd overall helped by the official retirement of #1 Porsche and the #13 delayed by a stop-and-go penalty for a pit lane infringement. Three hours remained and just under three laps to take the lead... game on! The leading #38 Jackie Chan DC Racing Oreca was running at a pace that would make it catch-able in the time available but only if there were no slow zones or safety car periods. In GTE Pro at noon there was still all to play for in the four way Porsche, Corvette, Aston Martin, Ford GT battle raging with any of the top four possible winners. In GTE Am, things were more stable Ferrari-fest with long time leading #84 JMW Ferrari solidly ahead of the #55 Spirit of Race Ferrari and #62 Scuderia Corsa Ferrari. At 12:08 Laurent in the #38 Oreca made an unscheduled stop for rear end repairs allowing Hartley in the #2 Porsche to claw back more time. 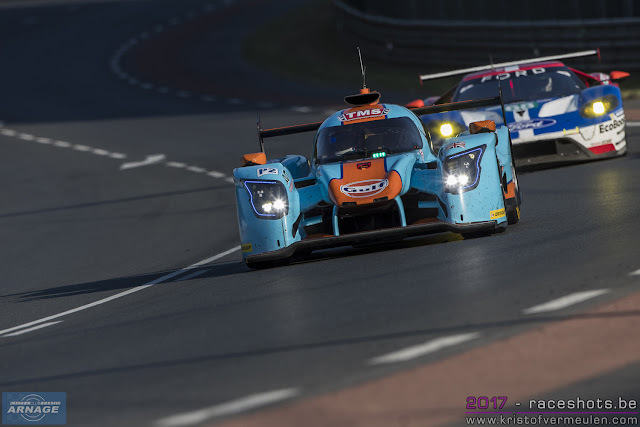 Meanwhile the last remaining Toyota #8 was also fighting back and had made it to 10th overall by that time, about half way up the surviving pack of LMP2 competitors. At 12:33 Timo Bernhard took over from a rather flushed and sweaty-looking Brendon Hartley for the final stint of the #2 Porsche. 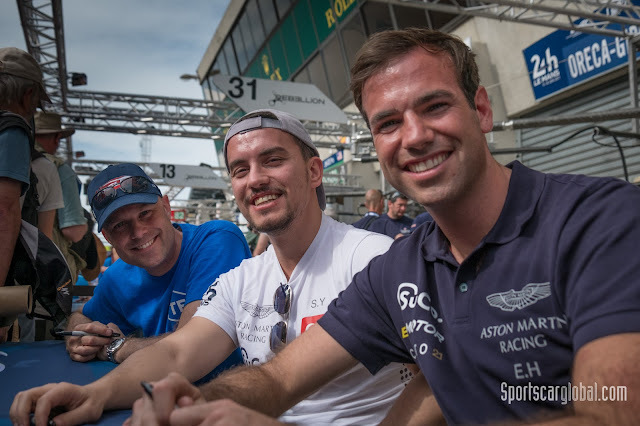 At 12:45 Piquet in #13 Vaillante Rebellion and Calko in #49 ARC Bratislava touched at the Dunlop chicane leaving debris on the circuit and bringing out a local yellow flag. Both cars continued and the yellow flags were only brief. At 12:49 Timo in the #2 Porsche 919 hybrid breezed past Laurent in the #38 Oreca LMP2 coming out of Arnage towards Porsche curves. Just before 13:00 Matt McMurry in #45 Ligier went into gravel at Mulsanne bringing out a slow zone, the last thing that Porsche needed in their fight back but it was lifted promptly at 13:02. The earlier ill-advised lunge at Dunlop chicane won a 10 second penalty for Piquet in the #13 Oreca. There was a fuel only stop for Bernhard in # Porsche at 13:20 followed a few seconds later by Laurent in the #38 Oreca who handed the car over to Ho Pin Tung. At 13:26 Buemi in the #8 Toyota finally broke Conway's fastest time of the race with a lap of 3:18.604. At 13:40 the gap between #38 and #2 was down to 44.176s with both cars requiring at least one more stop. The gap reduced to 28.621s by 13:45 and closing fast. By 13:52 the gap was only 3.2s and the pass would be made soon and so it was that between Mulsanne corner and Arnage Timo Bernhard drew neatly past Ho Pin Tung to take the lead. 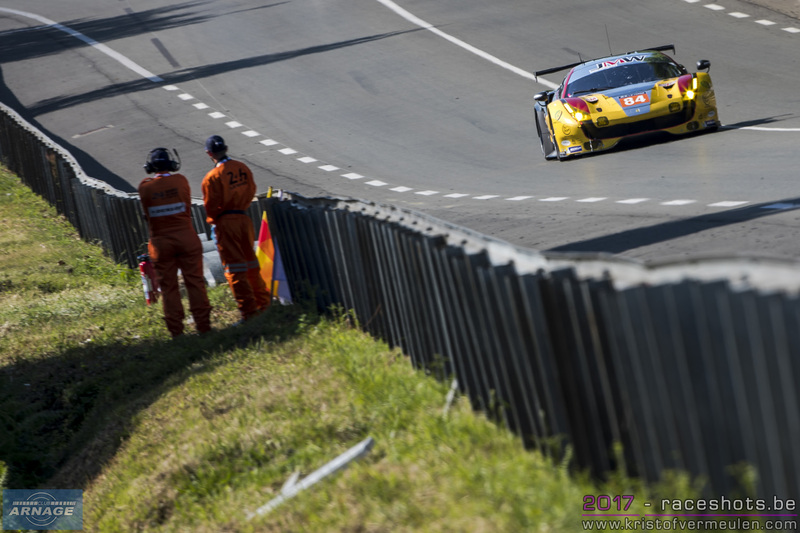 As the final pit stops in GTE Pro unwound the outcome remained open until the very end. 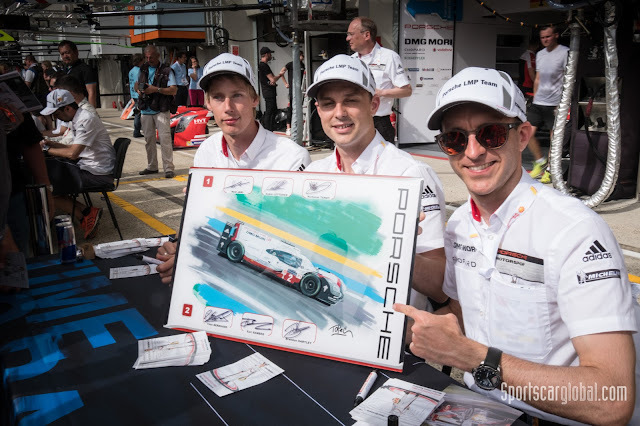 The final fuel-only stop for Timo Bernhard in the #2 Porsche 919 hybrid went smoothly with 54 minutes left on the clock but all eyes were on Taylor in the #63 Corvette which emerged from its stop a shade ahead of Adam in the #97 Aston Martin to take the GTE Pro lead. Negrao ran wide at Arnage into the gravel in the #35 Signatech Alpine but was pushed out by marshals with only a short yellow flag. That promoted the #13 Vaillante Rebellion to 3rd overall and second in class. The #35 returned to the pits and was pushed back into its box for a new nose and a clean-up. 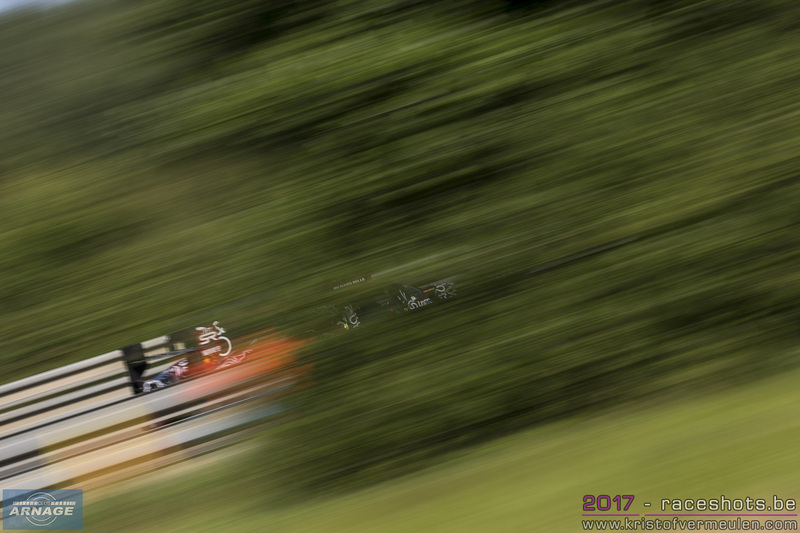 The top three LMP2 cars pitted for the final time with 23 minutes remaining on the clock. Bernhard in the Porsche #2 LMP1-h also stopped for a splash but had a decent gap so was in no danger of losing a place. 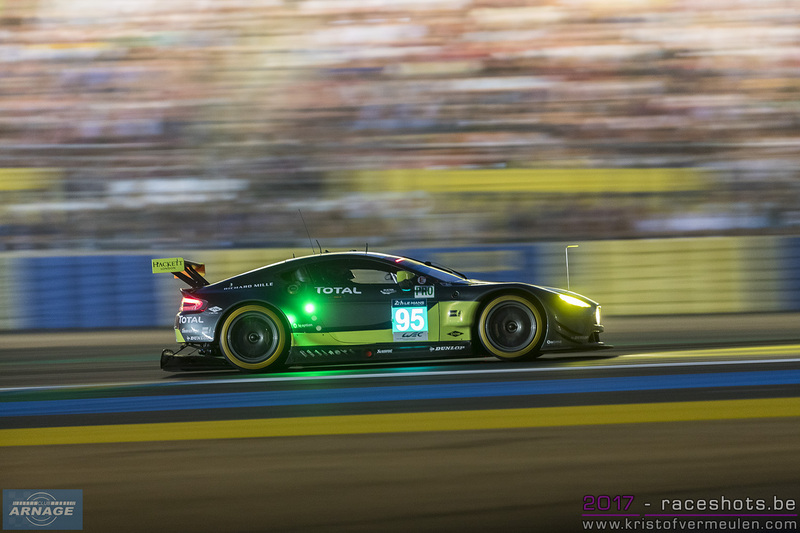 A late pit stop from #91 Porsche handed 3rd place in class to the Ford GT #67. 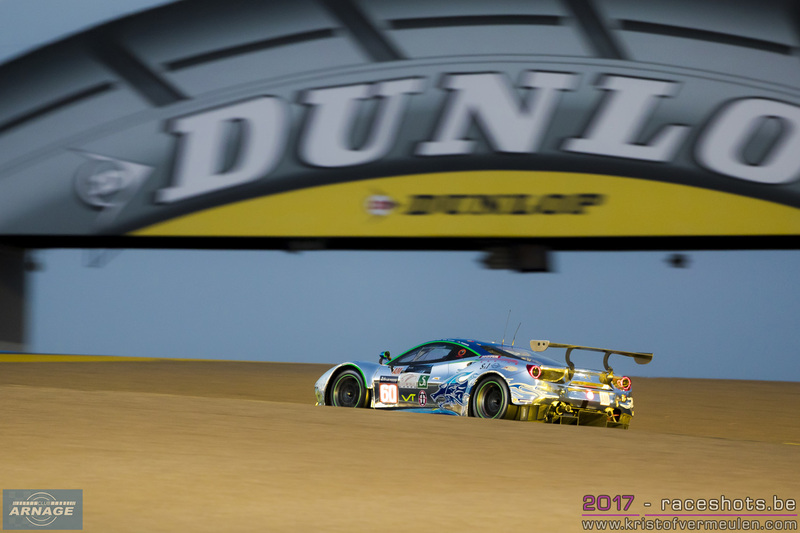 On the dash to the flag, the leading pair (#63 and #97) in the class were a mere 0.7s apart after nearly 24 hours racing. 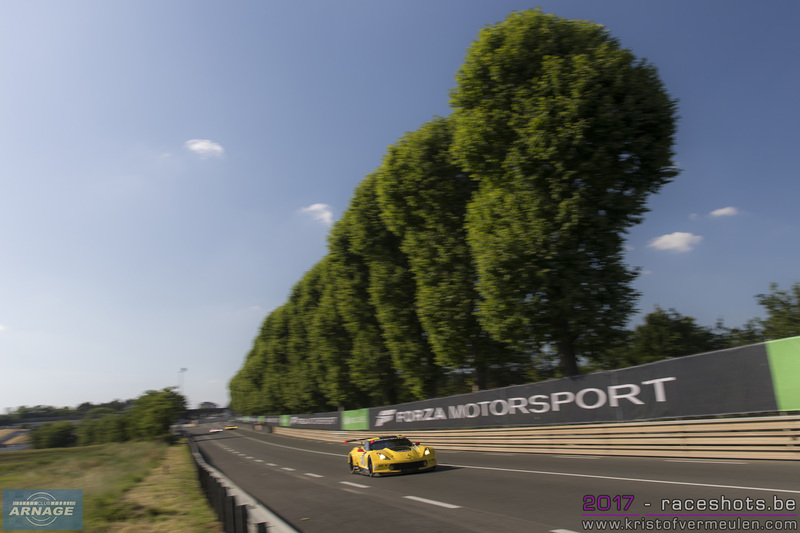 There was an incredible dice in the final laps between Taylor and Adam with a door-handling incident at Arnage corner with Taylor staying ahead in the Corvette. The following lap Taylor locked up and took the shortcut at the second chicane but remained ahead, but not for long as Adam made the pass on the exit of the Ford chicane. The Corvette straight-lined the Dunlop chicane having picked up a puncture. 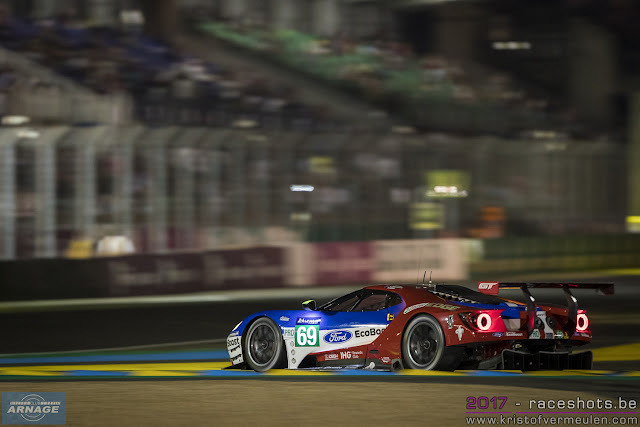 Tincknell managed to pass the stricken Corvette to take 2nd in the Ford GT #67. 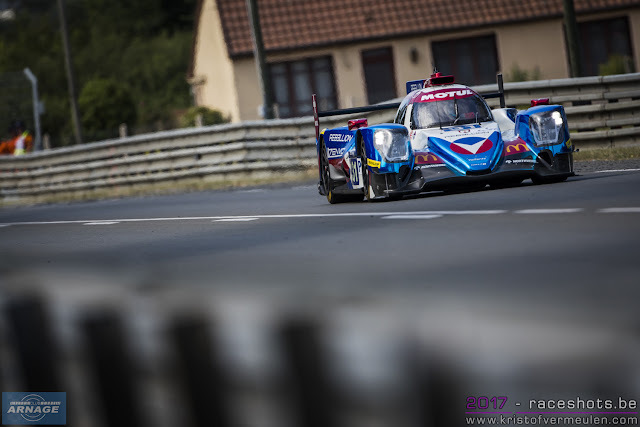 *** Update: Vaillante Rebellion #13 ORECA 07-Gibson has been disqualified from 24 Hours of Le Mans because of post-race inspection. 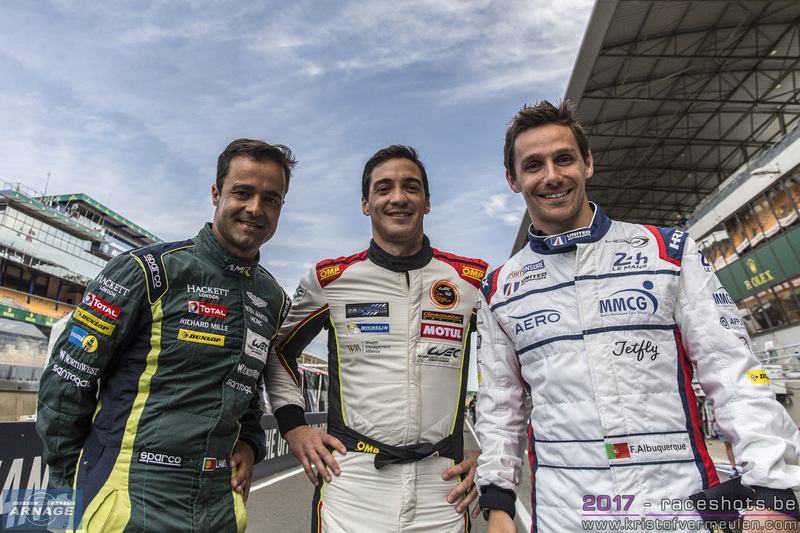 Mathias Beche, Julien Canal and David Heinemeier Hansson lose their second-place finish in LMP2 (3rd overall). The ORECA 07-Gibson violated Article 3 of the 2017 FIA World Endurance Championship LMP2 Technical Regulations: “No bodywork variation is permitted.” Jackie Chan DC Racing's second car, the #37 driven by Cheng Gommendy Brundle, is now classified 2nd behind its sister car. 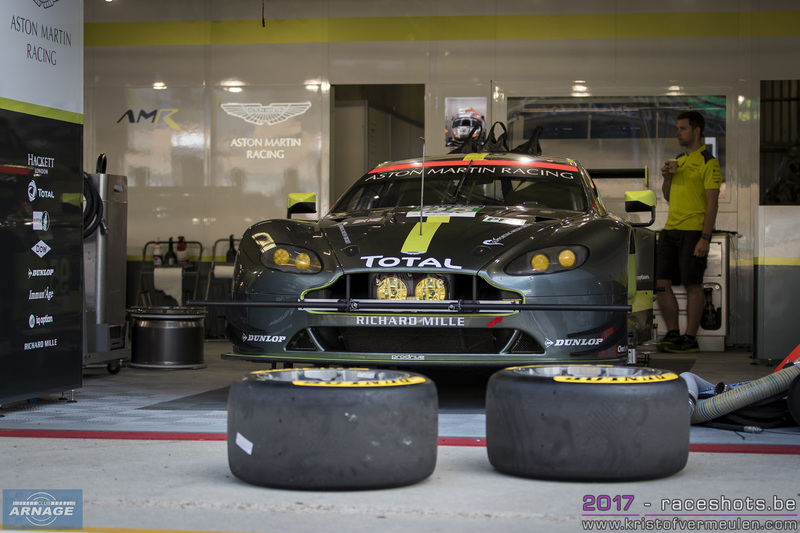 Le Mans 2017: The Michelin Man and his tyres.. 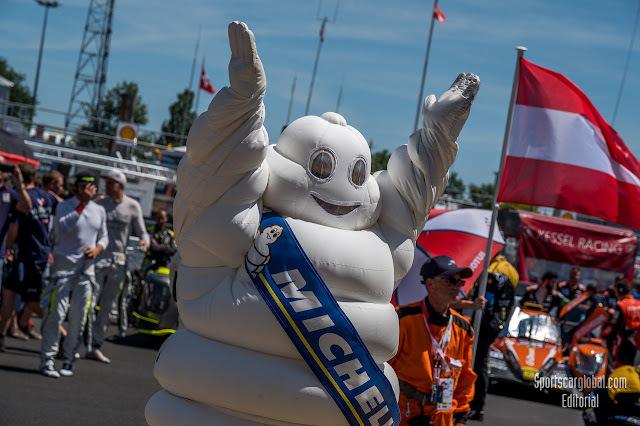 The Michelin Man or Bibendum to our French friends first broke cover when he was introduced at the Lyon Exhibition in 1894 where the Michelin brothers had a stand. He has become a classic icon here at Le Mans and this year is no exception. The demands of modern endurance raced have changed dramatically over the years and Michelin have continually been developing their tyres to keep up and try and get ahead. The race winning LMP1 car will cover around 5,000 kms over the 24 hours. It will lap the 13.629 kms circuit approximately 400 times. 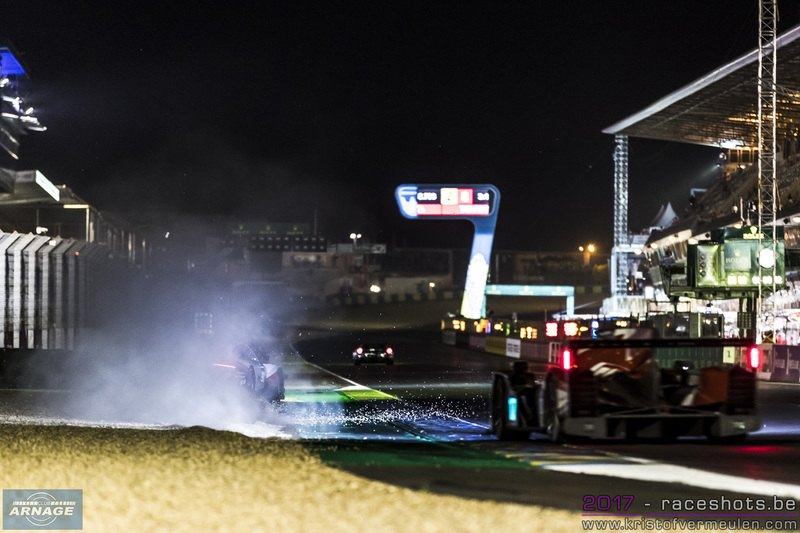 This year has been the hottest, driest one since 2000 and the cars are faster, with more downforce and as a final twist teams will be restricted to just seven sets of ‘dry’ tyres for qualifying and the race. Add to that the simple mathematics that an estimated 25 seconds can be saved each time the teams don’t have to change tyres and you will see that getting as many ‘stints’ as possible out of a set of tyres is crucial. The Porsche and Toyota teams are looking at 13 laps per stint as opposed to 11 last year. They have brought along around 5,000 tyres made up of a mix of three types of slick tyres..soft, medium and hard. There will be two types of wet tyres available described as ‘wet’ and ‘full wet’. The ‘full wet’ is capable of clearing 120 litres of water every second! We will have to take their word for that since 2017 has been bone dry! 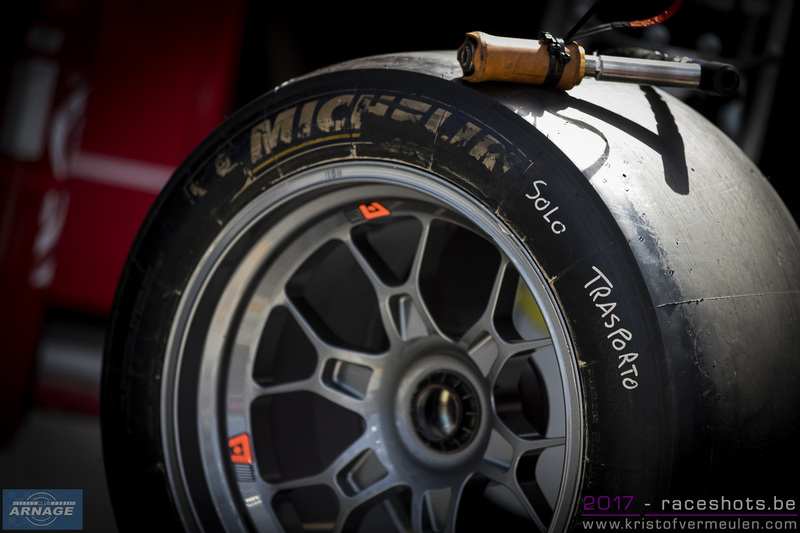 There is also a very special ‘Hybrid’ tyre for the LMP 1 teams. This tyre won’t be needed either since it is designed for damp and drying conditions. It is interesting to note that it is not a grooved tyre, it looks more like a slick. 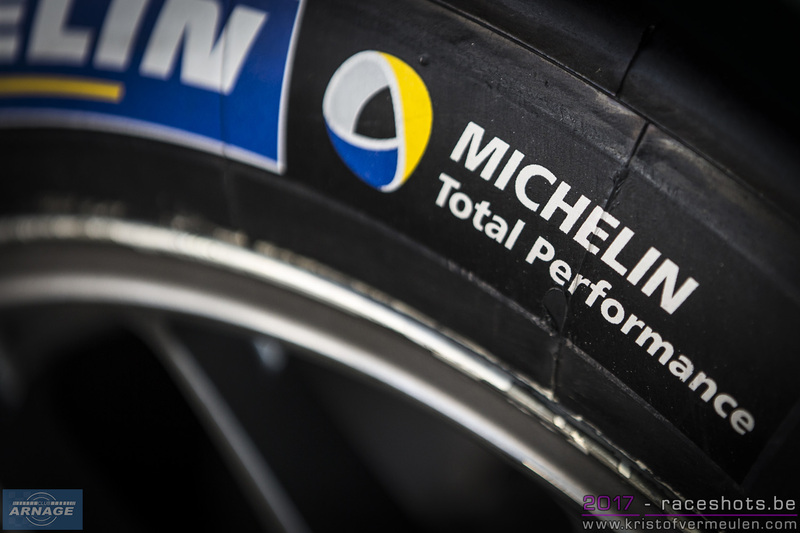 Like Dunlop, Michelin are also using RFID technology which involves a chip embedded in he tyre which communicates with the official timing system and race control. These tyres travel in an impressive fleet of 13 ‘semi trailers’. When they arrive there is an 800 -square meter covered compound. There is also a 600 square-meter workshop housing 45 fitters. There are also twenty specialists who work with the teams all the way through the event. After the race all the used tyres are gathered up and returned to Michelin’s main base where they are dissected and then recycled. It is a huge operation that has evolved over the years and it runs perfectly year on year. It is always hard to judge but so far this year the circuit and surrounding roads don’t seem to be quite as mad as in previous years. However if you head off into Arnage there are the usual steady parade of exotic, mad and interesting machinery. 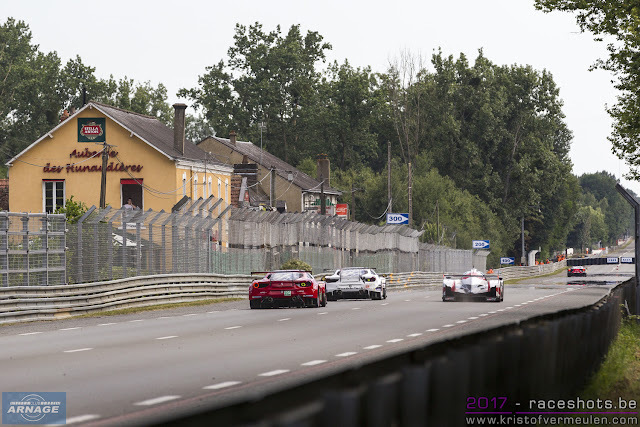 Nearly every year Le Mans 24hrs gives us a particularly ‘memorable moment’. 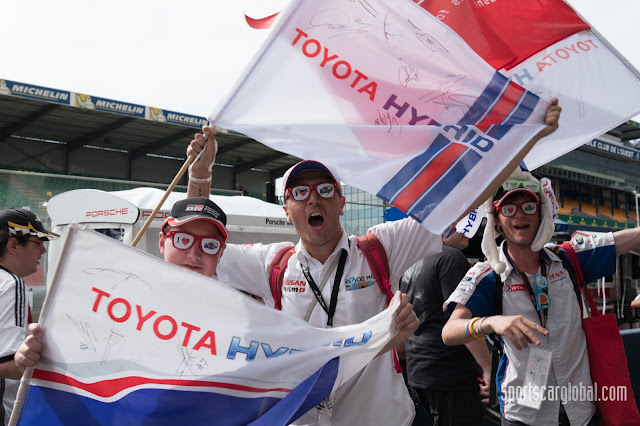 This year surely it was Kamui Kobayashi’s qualifying lap in the #7 Toyota TS050 - HYBRID . 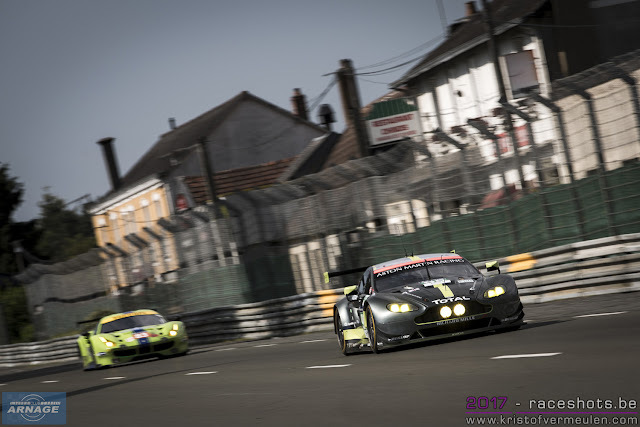 We caught up with the in-car footage on TV and almost immediately you got the feeling we were watching something a bit special..even by Le Mans’ usual standards. The team had timed it perfectly and all the traffic was safely tucked away behind Kobayashi and he had an empty track ahead. As far as we could see he didn’t need to pause to pass a single car. To say “He went for it” is an understatement. 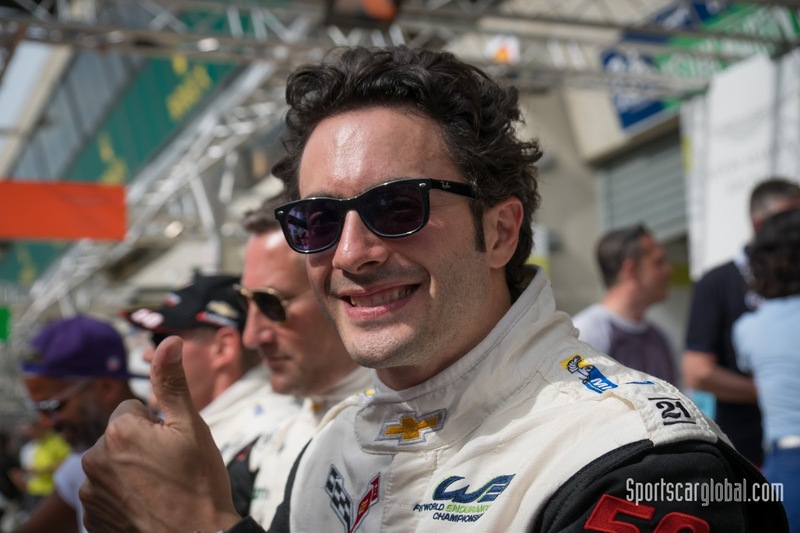 He crossed the line having posted a 3:14.791, a clear 2.337 seconds ahead of his team mates...that is a lifetime at Le Mans. This was the fastest lap ever recorded with the track in its current length since 1971. It was pretty clear that nobody would get near that time so pole position was safely in the hands of Toyota. 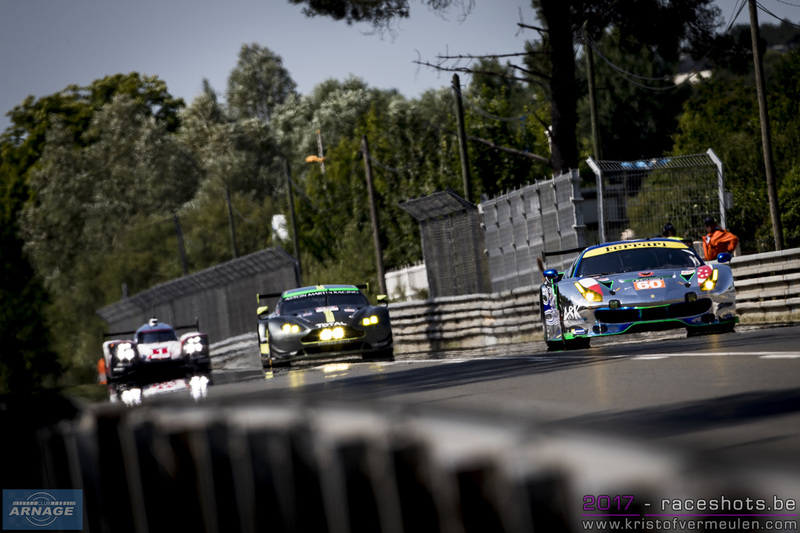 Porsche were off the qualifying pace but who knows what they have in mind as a ‘race pace’. One thing is certain and that is Toyota have three cars and Porsche two, so their tactical options should be better. The #2 Porsche 919 Hybrid ended the third session tucked away behind a wall and out of danger. We gather their engineers told Brendon Hartley to switch it off. The commentators suggested that with car still ‘charged up’ the drivers have to jump out and away from it to save getting a thumping great electric shock. This didn’t seem to apply to the marshals! 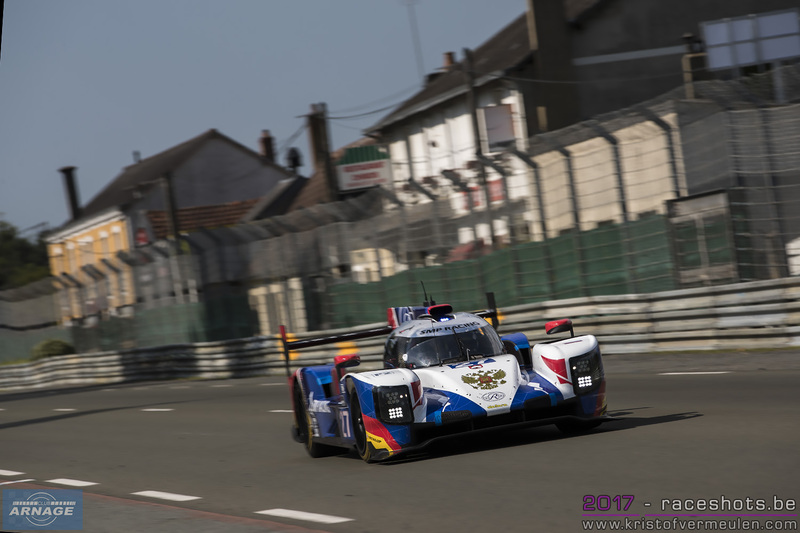 LMP2 has been a revelation, once again lap records have been wiped out and the general feeling is that the current LMP2 cars are blindingly quick in places that irritate the LMP1 cars. 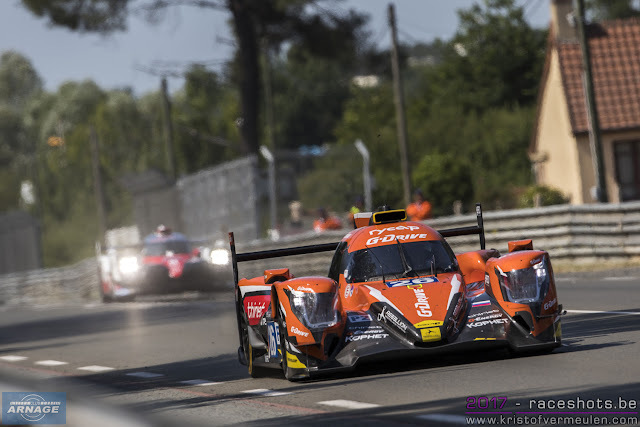 Overall the LMP1 cars are of course quicker by far but there are parts of the track where an LMP2 can quite legitimately be tough to overtake. 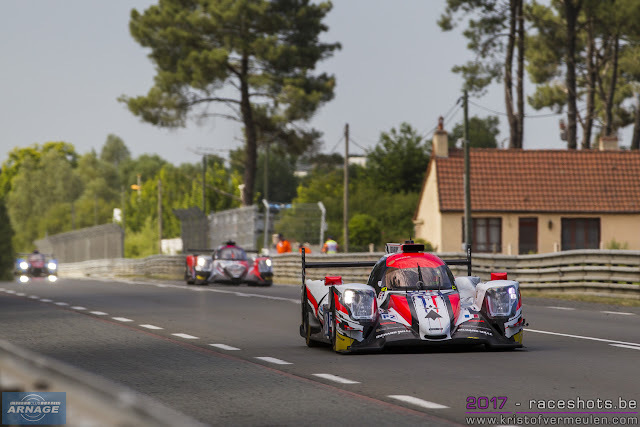 The quickest LMP2 was the #26 Oreca 07. 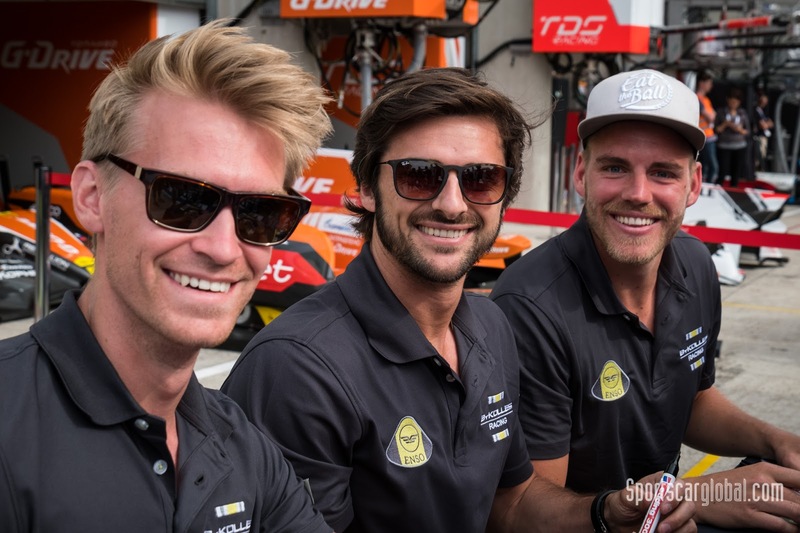 They posted a 3:25.352 which was perilously close to the ‘non hybrid’ Bykolles Enso CLM P1/01 time of 3:24.170. Not wishing to make too much of a political point about it but Ligier were unhappy about over their ‘Balance of Performance’ issues. 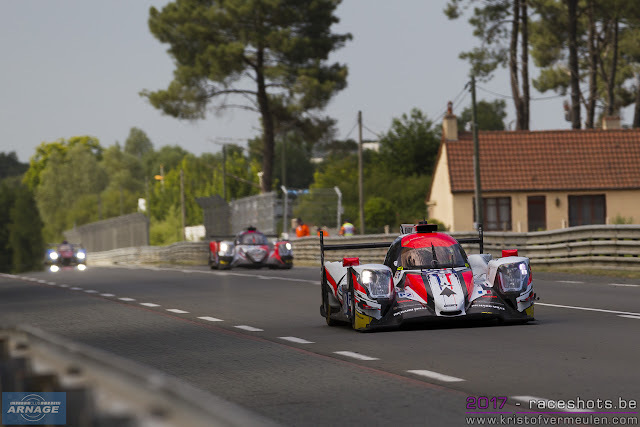 Oreca on the other hand were not complaining.. they had ten of their cars on the grid ahead of the leading Ligier. Ligier were also behind Dallara and Alpine. Something doesn’t feel right! As we mentioned this year’s LMP2 cars are far, far quicker than last year and apart from anything else there will be no less than 25 of them out there wanted to share the same bits of track.. should be interesting..
We are assured that modern computer technology combined with sophisticated on board data collection have made the art of ‘sand-bagging’ a thing of the past. It was a strange session with cars out of place and so on, was somebody sand-bagging’?! To use the immortal words of Francis Urquhart in House of Cards “You might very well think that. I couldn't possibly comment”. The Ford Team had been complaining fairly consistently but if you were ‘sand-bagging’ scattering your four cars fairly randomly across the grid might not be the answer. Ferrari, who apparently were used to set the performance bench mark, were also at the back until the last few minutes of qualifying when the #51 Ferrari 488 GTE went up to second in class after 18 laps with their team mates behind the Aston but close behind. 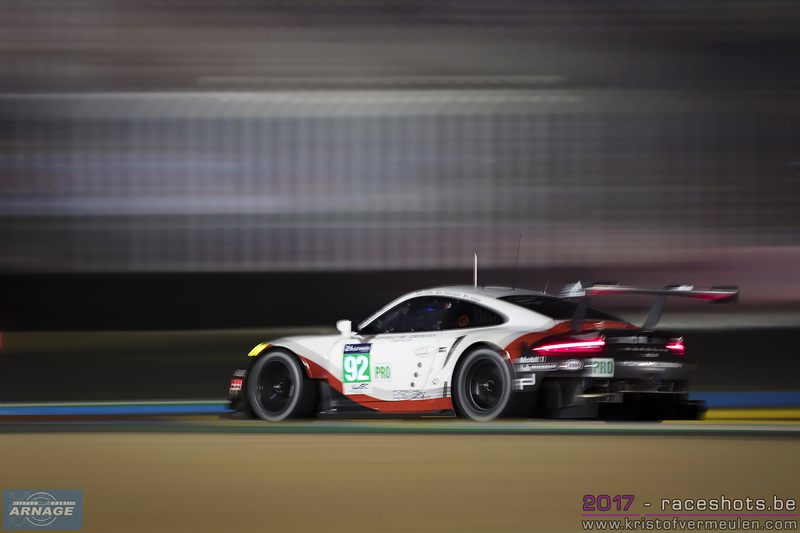 Porsche appeared to be doomed and getting nowhere with their much heralded new 911 RSR 991. But the BoP ( Balance of Peformance) gods smiled on them and 8kgs of weight were taken away. It was all a bit weird. It isn’t every day that we get the chance to give the ACO circuit workers a pat on the back but when the #33 Ligier JSP217 driven by Erik Maris ‘lost it’ coming out of the first chicane he took on the Armco in a big way, and lost. He was fine … but the Armco wasn’t! Out came the red flags and in came the repair team. A large truck loaded with stuff, a digger type vehicle a flurry of safety and maintenance vehicles plus an army of workers. Fifty one minutes later the session restarted with a huge chunk of brand new Armco and posts in place. They worked hard and fast. According to our professional weather man (or so he tells us) says there is zero chance of rain but maybe the odd cloud. So, according to Pierre Fillon President of The ACO this will be the first ”All dry” weekend since 2000. You guys out in the camping areas take care. 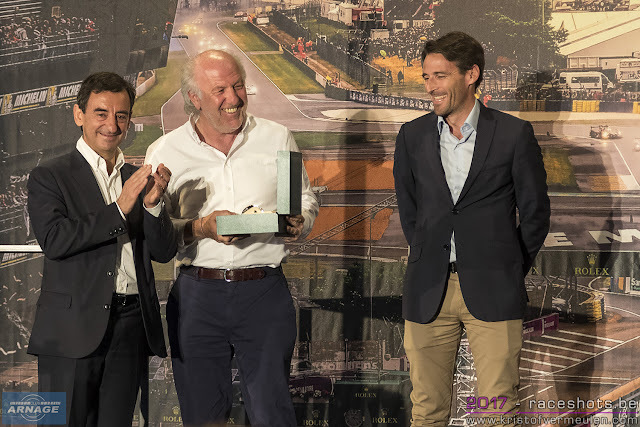 Le Mans / WEC 2020 Regulations and other announcements at ACO press conference. At the ACO press conference this morning the president of the ACO Pierre Fillon announced the outline of regulations for 2020 and the 4 years beyond. The main areas were safety, cost reduction and emissions. The space available for the driver will be increased and extra space will be allowed in front, above and to the side. Performance and cost will be controlled with one body aero design allowed for the whole year, but with more adjustment allowed for vents and wings front and rear. The angle that the driver sits will go from 35 degrees to 55 degrees. This will inevitably make the roof height of LMP1 prototypes higher. 'Plug in' hybrid systems will be introduced where the hybrid storage will be recharged at pit stops in addition to conventional fuel. 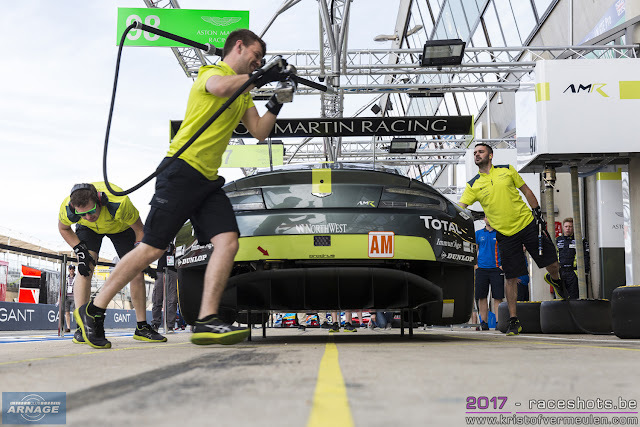 Once recharged the car will be obliged to run on full electric power for at least one kilometre (at Le Mans from the exit of the pitlane up to the entry of the esses). The ACO is also working on how to let the cars cross the finishline on electrical power. The other announcements were the honouring of Sir David Richards with the title 'Spirit of Le Mans', the Grand Marshal for 2017 will be Mark Webber, and F1 boss Chase Carey will be the official starter of the 85th 24 hours. Despite most people attributing this quote to him sadly Michael Caine never actually said this… and is getting tired of reminding people of the fact.. he did however say “You're only supposed to blow the bloody doors off!” in the Italian Job. Anyway this year’s programme has a little section in the driver bio’s called “Dit you know..” which is near enough for us..
- Each of the Porsche factory drivers spent 3.2 hours on a massage bed during the race. - IDEC not only sponsor the #17 Ligier JSP217 but also the IDEC Sport trimaran that won Jules Verne Trophy ( for the fastest circumnavigation of the world) a record which it smashed by 40 days. - Jan Lammers former team was ‘Racing for Holland’ who raced here at Le Mans between 1999 and 2007. - Ayrton Senna entered just one Endurance race this was the 1984 Nürburgring 1000 km in #7 New-man Porsche 956 . They came 8th. - Philip Hanson driver of #34 Ligier JSP217 is the youngest driver in the race, he is 17 years old. - #49 Ligier JSP217 run by ARC are the first team from Bratislava to enter 24 hours of Le Mans. - Chip Ganassi came to Le Mans in 1987 driving a Sauber C9… he didn't finish. - Chip Ganassi Racing have won the Indianapolis 500 on four occasions. - To date Porsche have achieved 105 class wins at Le Mans.. a record. 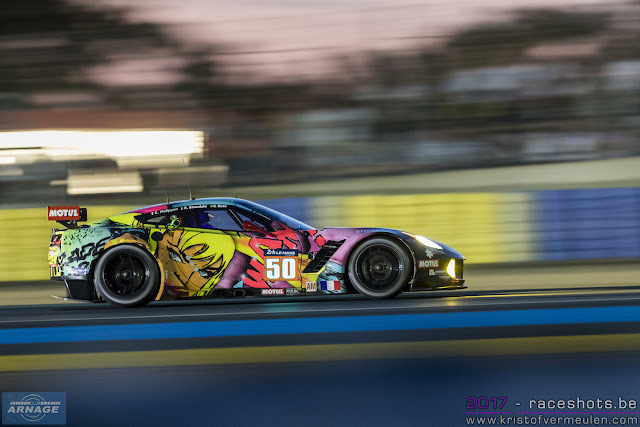 - Christina Nielsen driving the #65 Ferrari 488 GTE is the only woman competing here this year. - Tracy Krohn and Niclas Johnsson #83 Ferrari 488 GTE have raced together here at Le Mans eleven times .. a record for team mates. - The first time a car appeared in Gulf colours was 50 years ago in 1967.The car was a Mirage M1 painted in “Zenith Blue and Tangerine. The Mirage M1, was a prototype sports car based on the Ford GT40 and built by John Wyer Automotive Engineering. 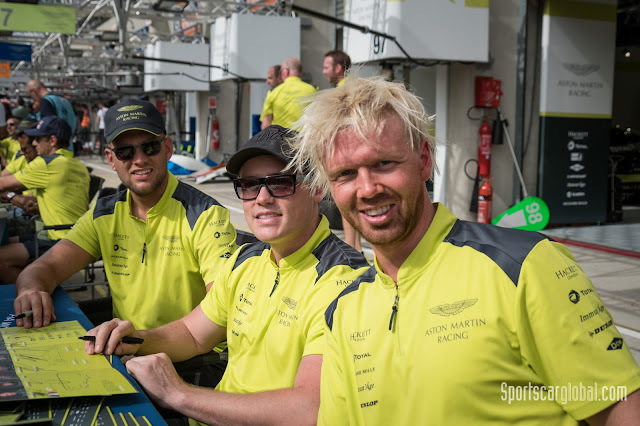 - Salih Yoluc #90 Aston Martin Vantage is the first ever Turkish driver to race here. - Mathias Lauda #98 Aston Martin Vantage is Niki Lauda’s son. - The Porsche 919 Hybrid has 24 buttons on the steering wheel! Perhaps the most iconic thing you will see when you arrive at Le Mans the first time is the famous Dunlop Bridge. The original bridge was built way back in 1932 and in one form or another it has been there ever since. In 1986/7 it was moved to its present location to leave room for the new chicane. Dunlop have been supplying tyres to competitors ever since. They supplied tyres for the first ever running of The Le Mans 24 hours in 1923, and this year will be the 85th running of this incredible race. As always Dunlop have a huge presence. Logistically this is challenging job. For a start you will need 6,500 tyres to look after more than half the cars on the grid (32 out of 60). These tyres arrive in 10 articulated trucks. This year there will be 80 members of staff to look after the whole operation. Endurance racing is very demanding upon tyres. 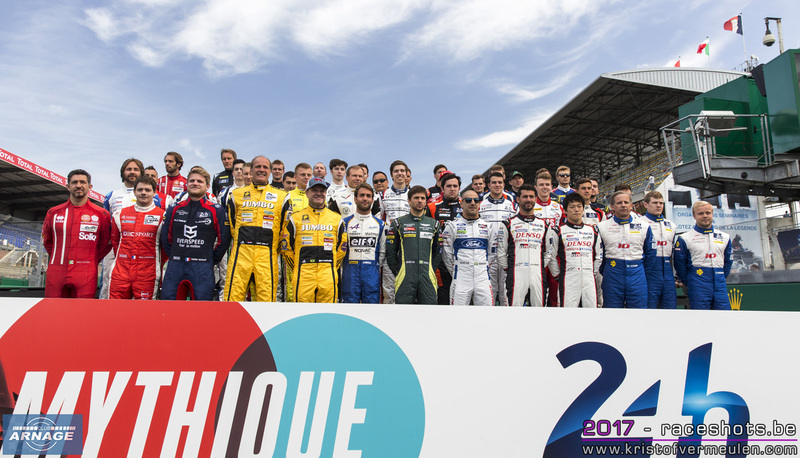 In LMP2 Dunlop are looking after 22 of the 25 entries. There are three specifications of tyres available .. a soft, medium, medium-plus as well as intermediate and full wet tyres. For free practice and qualifying teams are allowed 28 tyres and for the race a further 56. Just in case a tyre gets damaged they are allowed 4 spares. Much the same applies to GTE Pro and Am and they are allowed 32 tyres for free practice and qualifying and 60 for the race. You only have to do a little arithmetic to see why 6,500 tyres are needed. To make things more interesting for the spectators and the race organisers Dunlop have developed a system that uses RFID ( Radio Frequency Identification Device) . 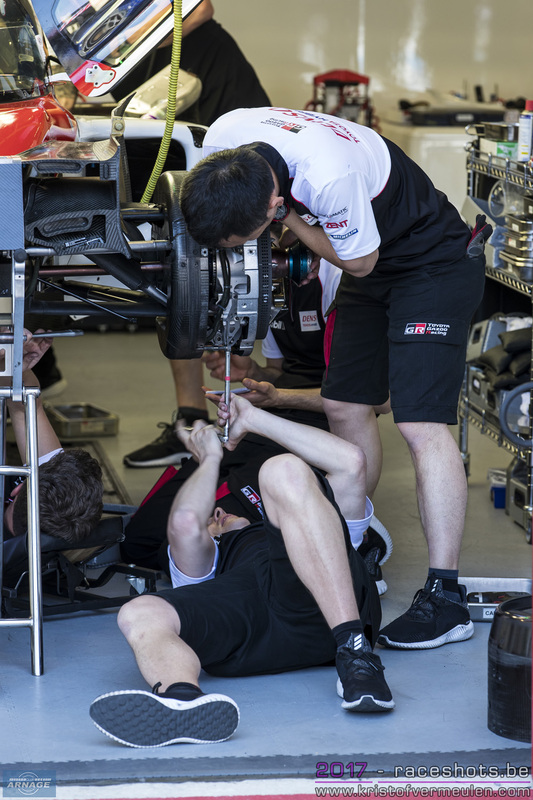 This involves an embedded chip in the tyre that passes on data about the choice of tyre and the number of stints the tyre have completed. This information is freely available to spectators, media and the race organisers. 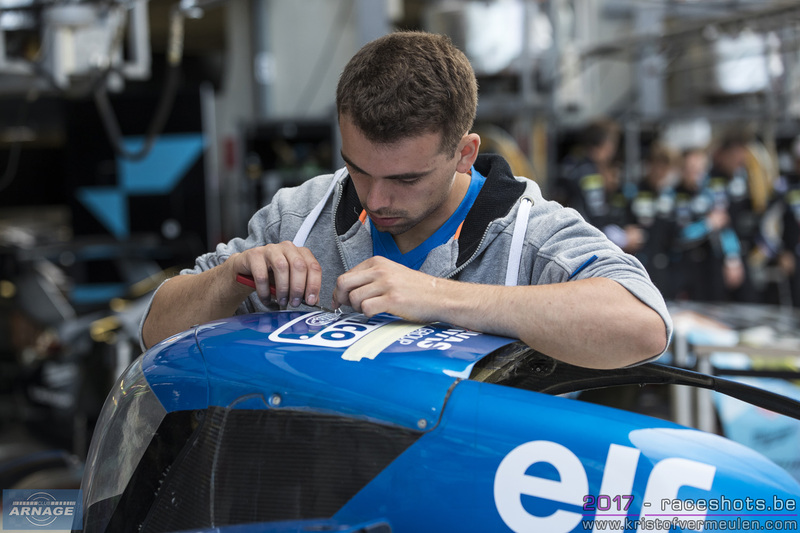 This technology is being used for the first time here at Le Mans but has been a regular feature with Dunlop in The British Touring Car Championship since 2008. It replaces the less secure ‘bar code’ system used in the past. So bear a thought for the technicians and staff who will be working in shifts for the whole 24 hours. After a delayed start to the first qualifying session due to barrier repairs between Arnage and the entry to Porsche Curves, it is good to be able to confirm that it would appear we have a motor race on our hands! 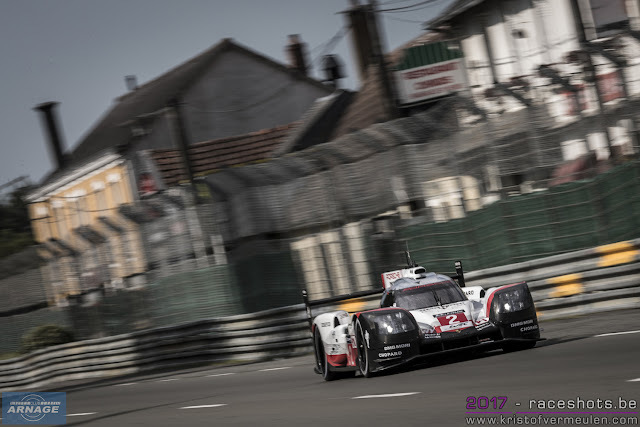 In numeric order the three Toyota TS050 Hybrids were split by the #2 Porsche 919 Hybrid; the #7 of Kamui Kobayashi setting a provisional pole time of 3:18.793. The sister #8 car currently joins it on the front row, 3-tenths faster than the faster Porsche #2. Given the oppressive conditions, even at 22:00 local, it should not be surprising that the time is a full second slower that the Test Day time set by the #7 Toyota. It was also good to see the #4 ByKolles ENSO CLM – Nismo go faster than the LMP2 category pack in overall 6th place behind the factory-hybrids. We caught up with Dominik Kraihamer and Marco Bonanomi between session, both were a tad crest-fallen after the engine failure in the Practice session and suggested they would hold back on the new install to protect it for the race; a 3:28.887 is a fair result. The car is also fastest through the speed trap at 340.2kmh whilst others have wound on downforce and have marginally slowed as a consequence. A quick word for Porsche though who may have gone the other way and found greater straight line speed to ease passing, driver traffic worries. 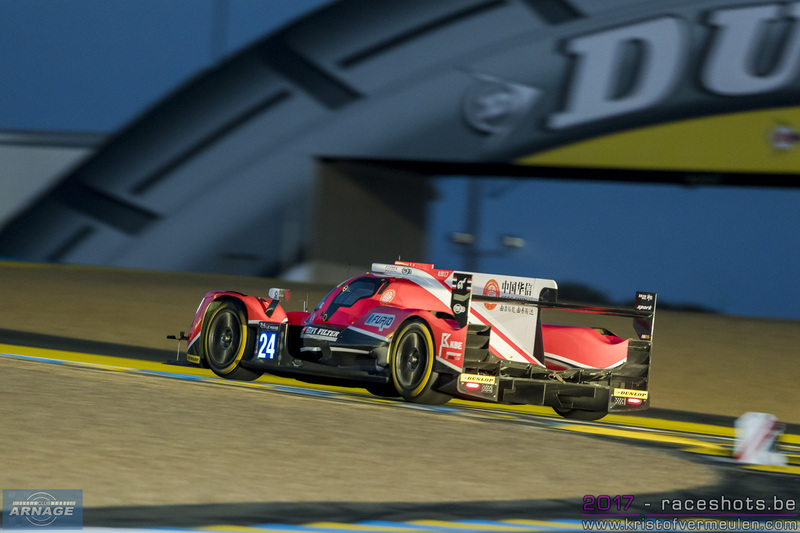 LMP1-H are now clocking 334.9kmh which is faster than the vast majority of the LMP2 field. 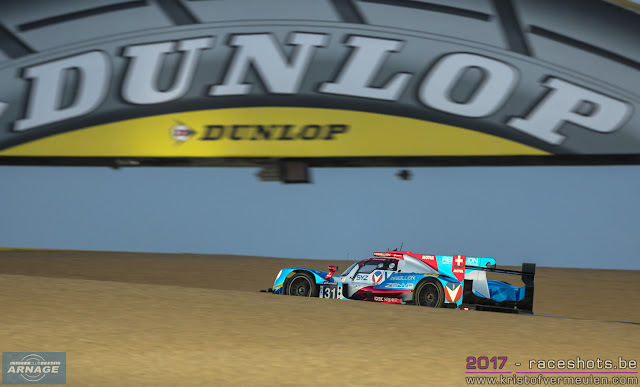 In LMP2 it is a battle at the front between TDS Racing #28 and the seeming lead Vaillante Rebellion #31 category pole currently with the #28 with a 3:29.333 by 5-tenths from #31 of Prost/Canal/Senna (had to get the line-up in!). 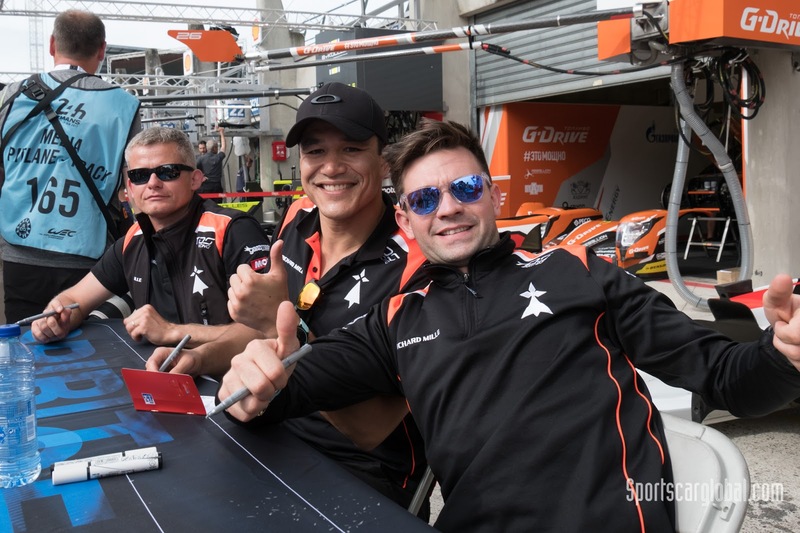 A little slower in the 3:30s, but good to see a resurgent CEFC Manor TRS Racing pair, pursue by the might of #38 Jackie Chan DC Racing Oreca run by Jota Sport. Indeed the Oreca 07 continues to prove its point as the class of the category taking the top 12 places. 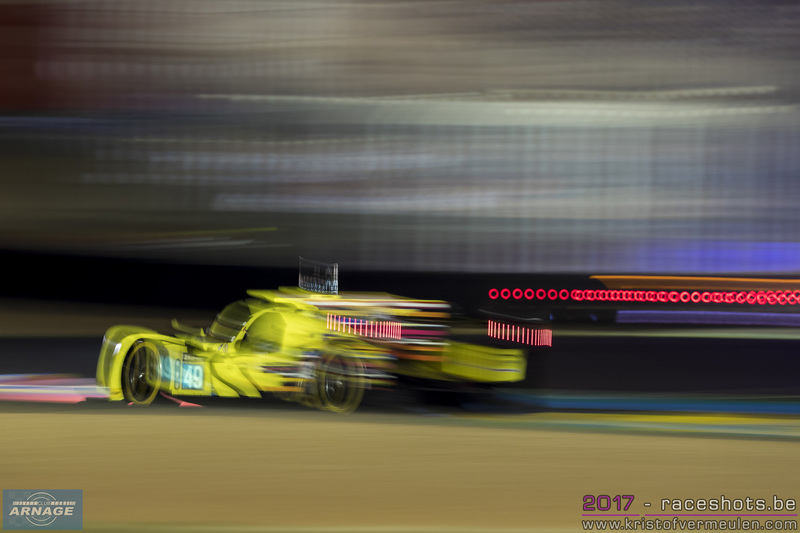 The fastest non-Oreca is the Racing Team Nederland Dallara #29 of Lammers/Van Eerd/Barrichello with a best of 3:33.796. 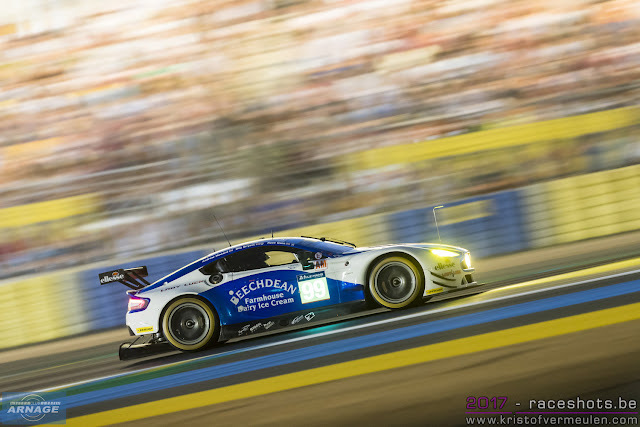 Two casualties of the qualifying session came to grief at Mulsanne Corner firstly the #39 Graff Racing car in the hands of Eric Trouillet slid very wide on the exit crossing the gravel and finding the tyre protected wall to lean on. 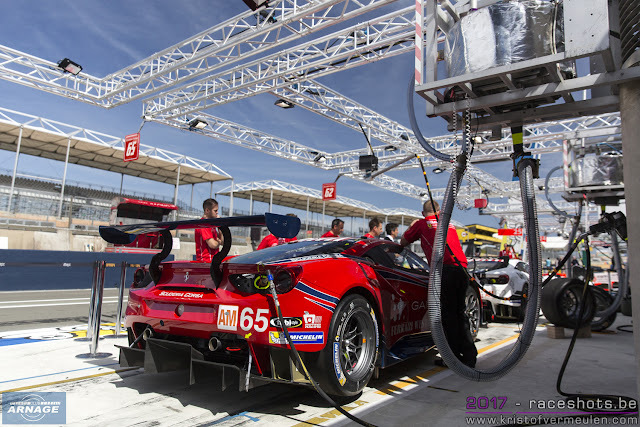 This was craned away and once set back down returned to the fray, proving the Oreca is both quick and solid. 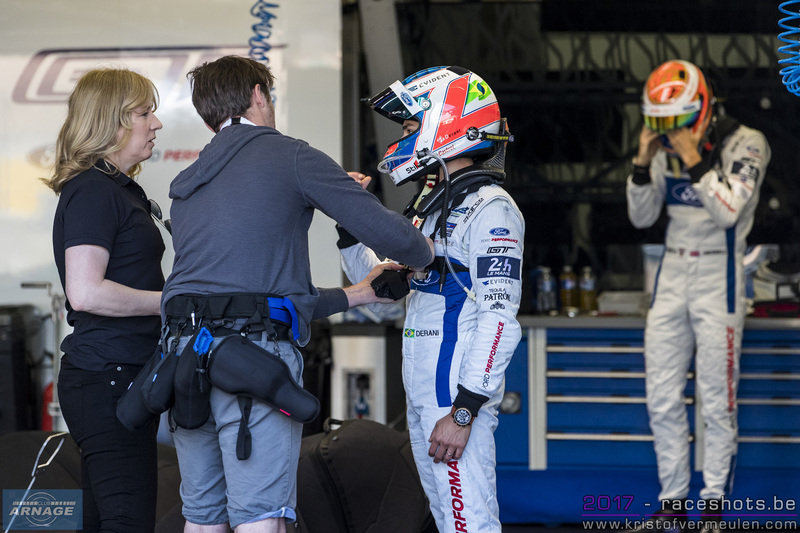 The second off was of more concern #27 SMP Racing Dallara came to a stop off line on approach to the corner alight! The fire caused substantial smoke, and judging by the odour much carbon-fibre will be needed to repair this Russian team’s entry. 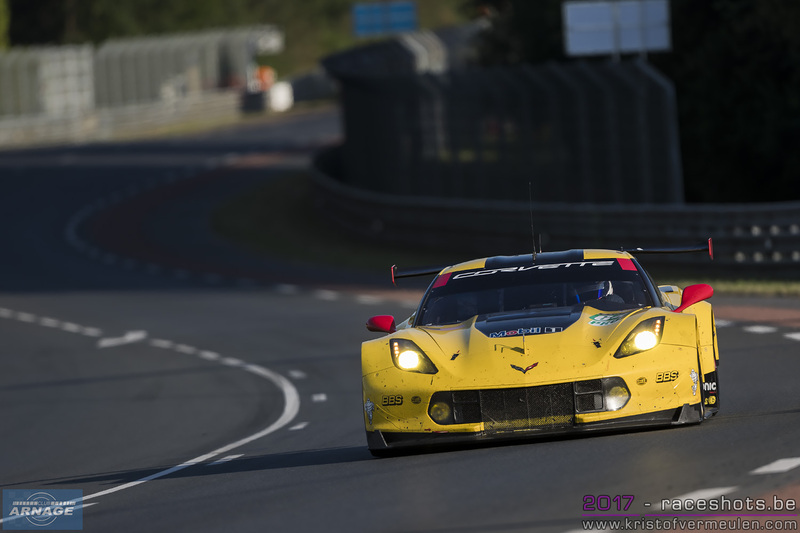 GTE-Pro has been impacted by a revised BoP for the Corvette Racing CR7-Rs, such tiny tolerances and margins at play, 0.2mm adjustment to the restrictor has slowed these cars from category fastest on Test Day to 9th in class currently. We hear speculation that Ford have generously provided their GM-rival with sandbags, but that as we say is idle speculation! 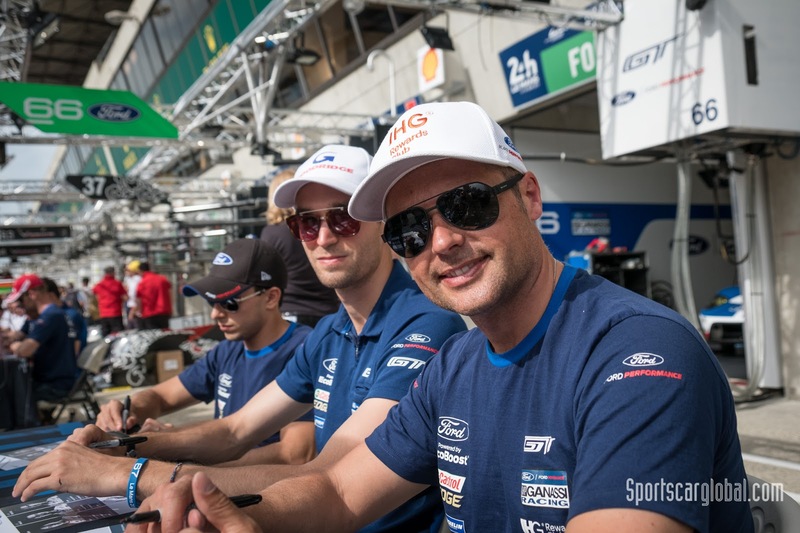 For Ford themselves the woes and travails of Test Day seem to have passed and the Pro GT is showing better pace, indeed the fastest car the #67 of Priaulx/Derani/Tincknell clocked 3:54.118 faster than the lead Corvette on 3:54.827. 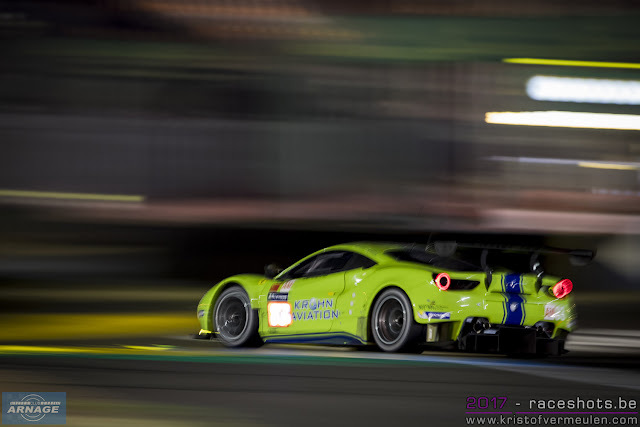 Ahead of the Transatlantic challengers it is the ever fast #95 in the hands of Nicki Thiim that sits a top the category pole at present with a 3:52.117pursue by the factory #71 and #51 Ferrari 488 GTEs both clocking 3:53s. We suspect that 3:53 or 54.0 is the target that the ACO considers appropriate for GTE-Pro, and if so it would appear they are finding a valid balance, Bravo Vincent Bravo! 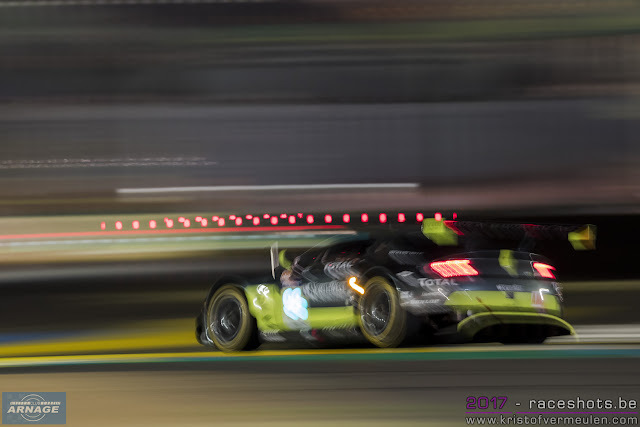 To conclude the fight is equally fierce in GTE-Am with Aston Martin Racing #98 very much leading the way on a 3:55.134 for Dalla Lana/Lamy/Lauda pursued by the Dempsey-Proton Racing Porsche RSR #77 and third placed TF Sport Vantage of Yoluc/Hankey/Bell (Yoluc being the 1st Turkish driver to compete in the 24h of Le Mans). The miriad of 2016-spec Ferrari 488s is led by the #83 DH Racing example of Krohn/Jonsson/Bertolini with a 3:55.966. 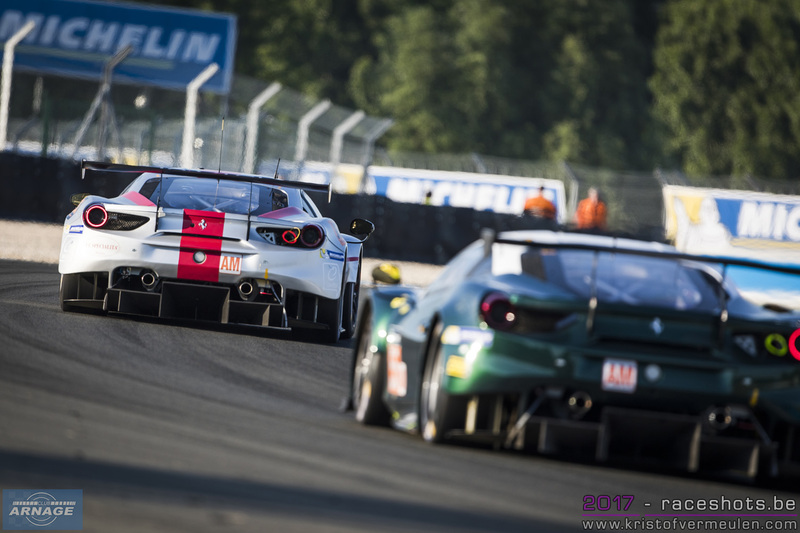 Three different examples of four cars lead the category with 1-sec of each other over a 13.5 km lap, that is endurance motorsport racing, where to be fastest over one lap does not matter. But it does once again demonstrate the health and wealth that constitutes the World Endurance Championship and its Crown Jewel event the 85th 24 Heures Du Mans.